I was introduced to this game about 10 years ago by one of my students. I have played it with all different ages and in a number of different settings. It is a blast. What a great game to play as part of your Mother's Day Celebration. Don't let the coin fall down the flour on your turn. Fill the cup with flour and pack it down really well. Level off the flour in the cup. Put the plate on top of the cup and flip it over. (Like building a sandcastle). 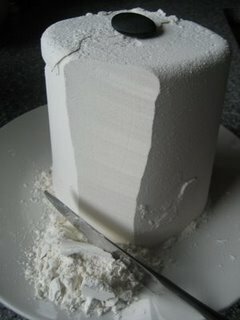 Carefully hit the edges of the cup to loosen the flour from the cup and lift the cup of the flour. Place the coin on the top of the flour, right in the middle. Now you have a flour "tower" with the coin balanced on the top. Each person, on their turn will take the knife and cut a little of the flour away. Making the cut straight down, top to bottom. (You can cut away as much or as little as you like). Everyone continues to take a turn cutting away flour until someone makes the coin fall. Whoever makes the coin fall must get the coin out of the pile of flour with their mouth, no hands allowed. Once someone has had to fish the coin out of the flour, pack the flour in the cup again, and start over. Anyone played this one? going to give it try? I played this growing up, but instead of a coin or button it was a piece of candy, and if you got it out without getting any flour on your face you got another piece as a reward. Thanks for reminding me of this! we are trying it tonight. the games are my favorite. please keep posting them! great ideas! I grew up playing this game too- it is an FHE staple in England- and it was always a candy on top. The person trying to retrieve it though always got flour on their face because my dad would push them in.